February 1, 2018, 9:31 PM · Welcome to "For the Record," Violinist.com's weekly roundup of new releases of recordings by violinists, violists, cellists and other classical musicians. We hope it helps you keep track of your favorite artists, as well as find some new ones to add to your listening! Tomás Cotik. Photo by So-Min Kang. 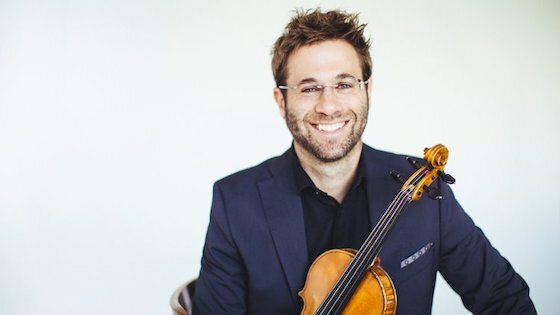 "Mozart was a keen observer of mankind, and boundlessly empathetic, but what he expressed in his music is us, not himself," said scholar Cliff Eisen, who is quoted in the the liner notes for this new recording by violinist Tomás Cotik and pianist Tao Lin of the complete Sonatas for Violin and Piano by Wolfgang Amadeus Mozart. Cotik, a soloist who also teaches violin at Portland State University, also has recorded a number of other albums with Lin, including Astor Piazzolla: Legacy as well as several Schubert sonata albums, for which shared many of his insights on his Violinist.com blog. BELOW: Tomás Cotik and Tao Lin play Mozart's Sonata in A major, Op. I, KV 305 (293d), I. Allegro di molto. Violinist Judith Ingolfsson and pianist Vladimir Stoupel present a program of works by Poulenc, Ferroud, and Ravel. As a duo, they specialize in performances and recordings of repertoire ranging from the traditional to the unjustly forgotten or neglected, with a special focus on music of the 20th Century. BELOW: A short film about the Duo Ingolfsson-Stoupel, produced in Berlin at the Institut Français by ShimSham films. "Intuition" was conceived by cellist Gautier Capuçon to "reflect the story of my life and follow the various stages in my emotional development," bringing together works by Saint-Saens, Faure, Massenet, Tchaikovsky, Rachmaninov and Elgar, with newer music by Astor Piazzolla, the Italian cellist Giovanni Sollima, and the pianist, Jerome Ducros, who also appears on the album. '‘Since childhood, intuition has guided me on my journey through the cello landscape. Before horsehair vibrates across strings, before technique and training kick in; music begins with intuition," Capuçon said. BELOW: "'Salut d'amour' is like smiling with my cello,' says Gautier Capuçon.BELOW: Gautier Capuçon plays "Salut d'amour," which "is like smiling with my cello," he said. February 3, 2018 at 03:50 PM · I love the repertoire for violin and piano duo, repertoire I have the good fortune to play fairly frequently. Thank you for let us know about this new Mozart recording. Please note that most of the major sonata repertoire is for Piano and Violin, not Violin Sonatas, or Sonatas for Violin and Piano. (Despite what the album cover of this new recording states.) These are indeed works of chamber music, but the piano does get first billing in the standard editions of these works. I always feel bad for the pianists, who, even in works where the piano part is more prominent, or equally so to that of the violin, they get somehow relegated to the role of accompanist. Even in the video of Cotik and Lin, the piano part is quieter than the violin part, and a bit watery sounding, making hard to hear the piano solos.